The Archive in Třeboň, Czech Rebuplic. After a 4 year pursuing to receive an appointment at the Archive, I finally made it. I always tried to combine the Re-Union of the former citizens of the parishes of Salnau and Schönau, with a visit to the Archive. Because of their slow E-Mail response, ( it will usually take 7-10 days before you will receive an answer from them), and their yearly vacation, closing the Archive from 24. July, to 8. August, and closed Friday’s. Unfortunately the Re- Union which is held every two years end of July, was not convenient. 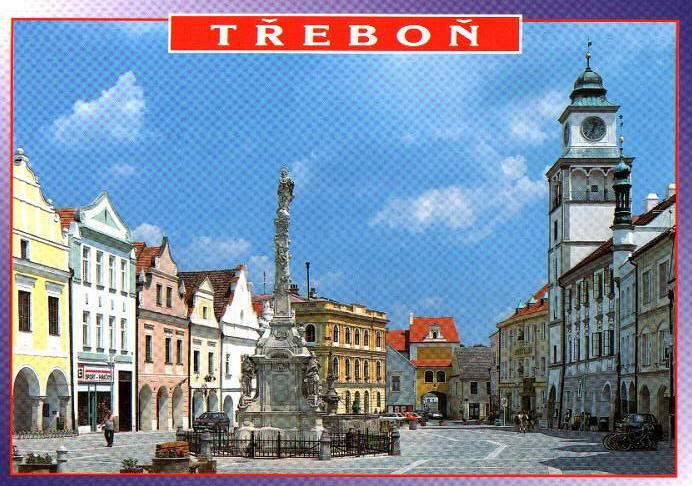 Which resulted for a week longs wait for the appointment in Třeboň. Besides to hunt for the available flights, it made all a little difficult. and click on Hotels, you will find only this Hotel, and follow reservations. I did not like to enter my correct Credit Card Number, so I entered random numbers just to lift away the reservation. You will receive a confirmation next day, with an e-mail Address, where you can reply and tell them that the Credit Card Number is not correct, and you will remit the charges directly to the Hotel with a check. The charges are for one person € 50. We were 2 persons, ( my brother ) and paid € 61 for a night. We had what was described as a double room, super clean. It is a huge room with high ceiling, 2 large chandeliers, 2 single beds, 2 sleeper sofas and 2 chairs, TV, and refrigerator. The bathroom was supper modern with a extra large bathtub almost as large as a whirlpool, shower and an over size sink. There are no screens in the windows. At one Hotel in Austria we had in the evening a hundred fly’s around the lamps. A breakfast buffet is included, with a very large selection of items to choose. You are permitted to drive to the Hotel, which is located in the Center of the city, and unload your suitcases. The center of the City, is like a very large Courtyard, like a market square. Marktplatz. Naturally all has to be paid in Czech currency,-Kronen, convenient is , that you can exchange your Dollars or Euros in the lobby of the Hotel. A 5% service charge is deducted. You also as a guest of the Hotel will receive a Card, in case you order any food or drinks, 10 % will be deducted from your bill. Don’t look for any hot dogs or hamburger. I could not find any. There is plenty of seafood on the menu because of many lakes close by. A ½ liter beer is a €, compared in Austria and Germany € 2.40. the service at the Hotel was fast an friendly, courteous business like. The German name for Třeboň is Wittigau. This city is fairly save and clean. It is an old city, the main attraction is of course the Castle of the early Rosenauers Aristocracies, and later the Schwarzenberg. The large attractive park surrounding the Castle, the many buildings belonging to the Castle. However , unfortunately some of the buildings have visible decay of stucco. It is also there where the Archive is located, just about 250 feet around from the Hotel. A reservation is a must: soatb@tiscali.cz it will take 7-10 days before you will receive an answer. Either English or German is O.K. The Archive is closed Friday’s, as of course in the last week of July and the first week in August every year. The personal is friendly, helpful, speaks some German. You will need a list, what books you want to search, and from what parish. The Archive has all the books from South Bohemia, and about 37 books from my parish of Salnau. I was there for 2 days, I kept a book next of many others, for 2days, the charge was about $ 1 a book. In case you have another person with you, there will also a charge of about $ 1 for the same book. Naturally it has to be paid in the Czech currency. Some days however they close at 3;00 pm. No Cameras or Videos are permitted in the study room. Bring a large note book, you have to write down all by yourself. No copying is available, some items are on Micro Film, but nothing yet from the books of the parish of Salnau. They will give you a key to store your camcorder or other stuff in a storage cabinet. It also is recommended to bring a magnifying glass, because some of the early Script letters are poorly written. I did learn to write the Script letters at an early age in the school, but I could not identify some names correctly from my families. Almost all books, except one are alphabetic numerated. I did start out with the earliest book from my parish. You have to find page 1 in the book. There you will have find the name,- example( Anna Schröder) besides 4-5 other names on that page. There you will find the itemized line: Father, mother, Witnesses, midwife, and other information. Sometimes when there are to many names, the page has more leaves. There were a few more S pages . sometimes the pages are continued at the end of he book. I also have realized that a page of S names was missing. In that case to make sure, you have to start from page one and go through the whole book. I did find most of it. I should have made reservation for 3 days. It was a pleasant experience. The nearest airport is Ceske Budjovice I believe. But the city of Linz in Austria is not to much further away. I did have a Rental Car. It is not cheap. 5 days € 270. Gasoline at € 1.17 a Liter, which translate to about roughly $ 6 a Gallon. for $ 1, a Kilogram apricots for a $1.20. Besides there is a lot more advertised as you drive along the road, blueberries, eggs, mushrooms, honey. Also as you come close to the border to Bavaria a dozen or so ladies were lining the street, of course distances apart. The Czech Republic did join the European Union recently. but they still demand a Passport when you cross the border from another Country. This is as close I could describe my Visit at the Czech Archive in Třeboň, Czech Republic. Written on this day Aug 25, 2004, respectfully Fred G.Schroeder. Photo correction: What was believed to be the Joe Steckbauer wedding is really the Joseph Pable and Sophie Steckbauer wedding; per Debbie Pable- Kois, Sept. 2004. The picture is also used in the front page montage. Many religious items: crosses, rosaries, prayer cards, missionary cards etc. Anyone ever hear of this story before? I remember my father telling me about a Father Bastion (sp?) who was a pastor there during World War One. Of course, St. Vincent parish was solid German, but Father Bastion was of French extract and sympathies. Once he gave a Sunday sermon about the evil Germans invading Belgium and France and the entire congregation rose from their pews and walked out. This story would have to be corroborated but unfortunately there is no one living to do so. The memory of my father relating this has become faint, but I think I have it straight. Ever hear of this?